1 serving early morning, daily. Contains spirulina, wheatgrass, moringa, spinach etc. Trugreen is a combination of spirulina, wheatgrass, moringa and spinach, for an early morning shot. 1. 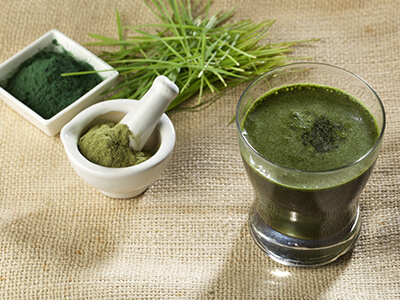 Spirulina is a rich source of protein, 62% of it made up of amino acids. It is also a rich source of vitamin E, A and B­complex vitamins, minerals such as iron, zinc, copper and selenium. 2. Moringa leaves are one of richest source of provitamin A , beta carotene, which is an antioxidant as well. Apart from this, the green leaves are one of the richest sources of micronutrients such as calcium, iron, copper, manganese, zinc, selenium, magnesium, B­complex vitamins such as folates, vitamin­B6, thiamin, riboflavin, pantothenic acid, and niacin. Most of these vitamins function as coenzymes in the energy metabolism which is helpful for weight loss. 3. Gum arabic is a good source of dietary fibre and helps the digestive system run smoothly. 4. Wheatgrass is a source of dietary fibre, chlorophyll, amino acids, several minerals, vitamins and enzymes. Wheatgrass is a powerful detoxifier, especially of the liver and blood. It helps neutralize toxins and environmental pollutants in the body. 5. Stevia is a plant based sweetener with no calories. One of the major sweet compound in stevia is stevioside which lowers hypertension, improves function of the insulin thereby helping to lower blood sugar levels and also, decreases bad cholesterol and prevents heart diseases as well.